16 December 1966 the Vallejo was commissioned into service for the US Navy. Once again the City of Vallejo came through with flying colors. The crew was divided into Blue and Gold. Commander Douglas B. Guthe would helm the blue crew while Commander John K. Nunneley helmed the gold crew. Commanders Guthe and Nunneley with the Mayor of Vallejo, Florence E. Douglas. 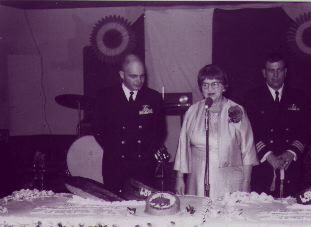 The commissioning party was held at the Casa De Vallejo Hotel. 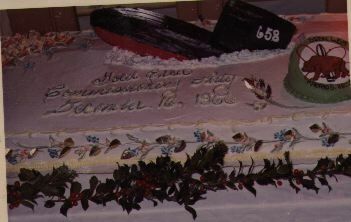 Special cakes were prepared for the celebration. Both crews had gathered for a night filled with music, speeches and dedications. The commissioning of a vessel is always a grand experience. 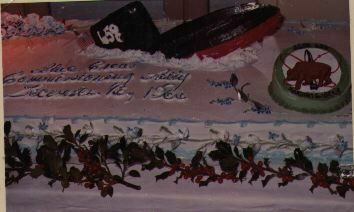 But for the 658, her crew and the people of Vallejo this was a very special event indeed. The 658 made her last port call to Mare Island in 1994, on her way to the scrap yard. Some of the Plank Owners were fortunate enough to sail her for one last time. The Decommissioning crew took them out for a day. The last few days of her existence were spent among the people who had built her. Shipyard builders were in awe during their tours of her while she was moored at Mare Island. Even though she had been through several overhauls in her career, the craftsmanship could be seen. They were appreciative at how well kept she was by the many that sailed her over the years. Efforts were made to save her from the scrap yard but fell short when the Navy felt a static display could possibly jeopardize treaties covering such things. She fought for peace and, like so many of our heroes, she died for the peace she preserved. The next page is filled with photos of the commisioning celebration. Names have been provided where possible. Please enjoy the photos and thank you for visiting our site.